You cannot have a functioning kitchen or bathroom without a sink, but the options available can sometimes read humdrum instead of noteworthy. 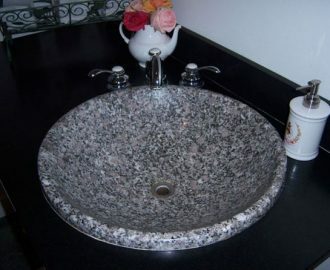 The addition of a stone sink to your kitchen or bathroom is a great way to add an unique twist on such a commonplace item. 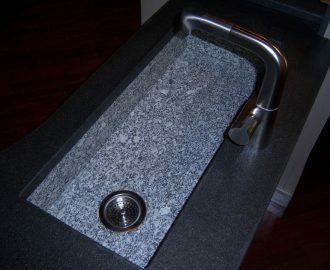 Additionally, the ability to completely customize the sink to your preferences make this option ideal. See below for some of the styles we have fabricated to date. 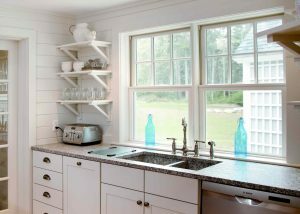 The traditional apron-front sink, also called a farmhouse sink, has been around for centuries. Originally designed for those who had to carry water into their home, the over-sized basin was quintessential for cleaning dishes, washing laundry, and even bathing young children. Today, apron-front sinks are desired not only for the ability to hold countless dishes, pots, and pans but for the classic style it exudes. 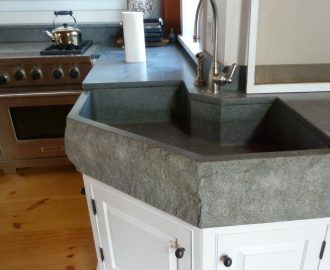 A sink carved from a solid piece of stone is an impactful addition to any kitchen or bathroom. 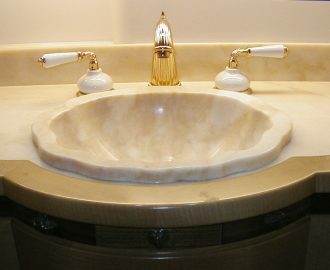 If you have been looking for a wow-factor, not knowing where to turn, a carved sink could be your pièce de résistance. 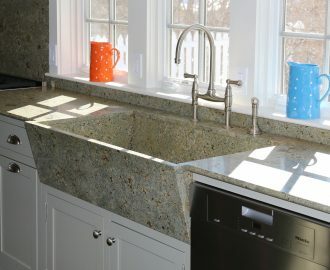 A drop-in sink is installed from the top your countertop and has a lip that keeps the sink in place. This sink style gives you the opportunity to have an intricately detailed boarder around your sink or to create a look reminiscent of a vessel sink. 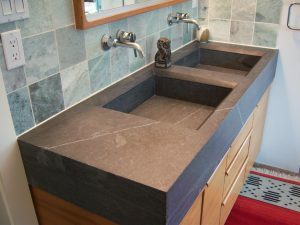 Undermount sinks have modern appeal, visually decluttering your countertop area with their streamlined look. 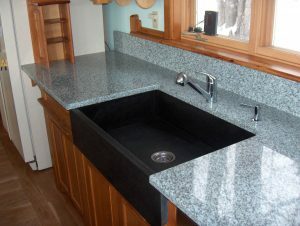 Additionally, this style makes cleaning your countertops a breeze due to its undermount installation. Crumbs can be wiped into the sink and their is no sink lip to clean around.